Craig Cowan of Variegate Concrete Concepts, in Lakewood, Colo., applied a solvenated acrylic sealer to protect this overlay, which was textured and colored to look like antique brick. He’ll make sure the color stays fresh by revisiting and inspecting the project after one year under warranty. Maintenance. It's the thorn in the lion's paw, the fly in the ointment, the missing horseshoe nail that brings down the whole cavalry. Time and time again, concrete artisans see their work diminished, aged prematurely or even ruined because it was not properly maintained. Incorrect maintenance often gravitates to one extreme or the other. Either the surface is neglected or it is cleaned too aggressively. So what can contractors do to improve the chances that their work will continue to look beautiful even when they are not there to protect it themselves? 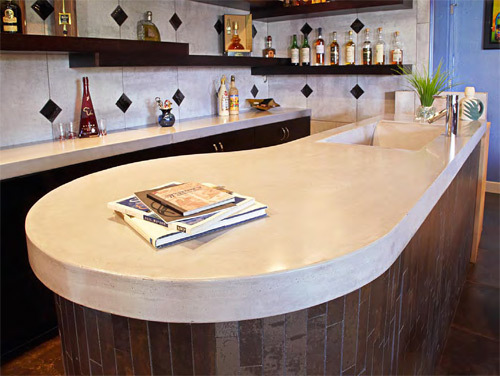 CK Concrete Design of St. Louis gives clients written instructions that say how to avoid damaging curing countertops, plus how to clean and protect them. The first step toward proper maintenance comes before the job is even finished. That first step is choosing and applying the best possible sealer. "The right system at the front end saves cost and maintenance in the end," says Shellie Rigsby, owner of Acanthus Inc., based in Plano, Texas. "Choose the right system, not the cheapest system. Choose one that can be maintained and to be sure it is, include maintenance instructions when you turn it over to the owners." 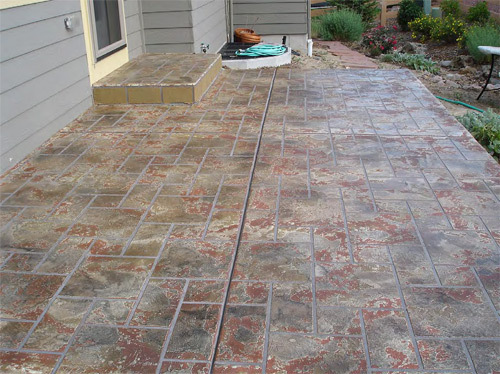 Many contractors with maintenance in mind like using a solvenated acrylic sealer for outdoor installations because the material is easy to reseal. "The solvent re-emulsifies the acrylic so you don't build up layers that could flake or peel - you have one cohesive coat of sealer," explains Craig Cowan, owner of Variegate Concrete Concepts in Lakewood, Colo.
A good solvent-based acrylic will last longer than a cure-and-seal product, adds Mac Gordon, owner and general manager of Concrete Solutions Plus, Louisville, Colo. "Cure-and-seals are essential to start with, but resealing should be done with a high-quality acrylic sealer." For interiors, Cowan uses the highest quality sealer he can - urethane, epoxy or polyaspartic - and then topcoats that with a protective layer of wax. He likes wax because it is cheap and easy for customers to strip and reapply. Even with a wax topcoat, Cowan still insists on a high-performance, low-maintenance sealer. "If people are going to neglect it, at least it will last longer," he says. Countertop sealers continue to be a topic of much interest, with nearly as many opinions as there are contractors. Whatever the reasons for choosing a countertop sealer, that choice will dictate the maintenance and resealing requirements. Because the sealer is what comes between the concrete and the traffic and spills, what looks like a dull or faded surface is often just a scratched, worn sealer, and not damaged concrete. 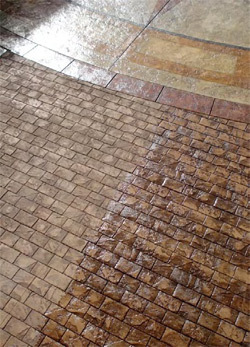 Preventing scratches, cleaning properly and resealing when necessary will keep decorative concrete looking its best. Homeowners can keep floors and counters looking nice longer by avoiding risky behaviors. Chris Klipfel, of CK Concrete Design in St. Louis, Mo., remembers one customer who tried to remove a wine stain from a shirt by soaking it in a bleach solution and laying it out on a jet-black concrete countertop to dry. "The outline of that shirt right down to the collar was etched onto that concrete," he says. Bathroom counters are vulnerable to stains from hair dye, which is highly alkaline, or to scorches from hot hair-care appliances. More examples of abuse are scratches caused by sliding rough bottles, unglazed ceramics or boxes brought in from the garage across a counter or floor. Aside from avoiding such extreme abuse, there are some simple measures homeowners can take to preserve their decorative concrete. Klipfel suggests setting a wine bottle on a towel before opening it to avoid scratching a counter. "People who take off their shoes inside the house are people I love," says Cowan. He also recommends placing mats on concrete floors just outside and inside doors and lifting and placing furniture rather than dragging it. "Treat decorative concrete floors as you would hardwood and they'll last a lifetime." Best cleaning practices start with the least aggressive methods first - sweeping or vacuuming floors and cleaning floors or counters with a damp cloth and water. If something stronger is needed to remove a stain or spill, contractors recommend mild, nonacidic cleaners like ammonia or dish soap without citrus. Products labeled "green" are usually a good choice, but Tommy Cook, decorative concrete consultant with Seattle-based CM Services, strongly advises that users check the labels. He once traced the cause of a blistered acrylic sealer to a cleaner that contained tea-tree oil. "If it says 'Do not use on acrylic,' don't use it on concrete sealed with acrylic sealer," he warns. Abrasive cleaners have the potential to scratch. CK Concrete gets the attention of their residential customers, most of whom are women, by pampering them. The company packages cleaning supplies and care instructions in a gift basket that includes a bottle of green cleaner, a soft microfiber cleaning cloth and sticky felt pads to attach to serving pieces or appliances that will slide around on the counter. Cowan gives each customer a personalized set of maintenance instructions and advice tailored to that specific project. Often the best way for contractors to ensure that their work is properly maintained is to do it themselves. One solution is to offer a regular inspection and maintenance program. For example, Concrete Solutions Plus recently took on a five-year maintenance program with the homeowners' association of a residential development. They will clean, touch up and reseal a large penthouse patio as needed. "We also do the resealing of all decorative concrete and gray overlays at this development every three years, but that is just arranged, not contracted," Gordon says. Gordon determines the price for an offering like the patio program by the square foot - usually between $1.50 and $2, depending on the size. Variegate Concrete Concepts offers an 18-month warranty on its concrete floors. They inspect after one year, and if the floor needs to be resealed, they do it under warranty. After the warranty is up, they call the customer every year and offer a free inspection. This encourages the homeowner to keep on top of maintenance and reseal before the surface is damaged. Rigsby offers her customers their first maintenance application free. After the floor is installed, after all the construction is finished, after the construction crew completes their cleanup, she comes back to the site and applies the final floor finish. Any sooner than that and she risks having the finish damaged to the point that it has to be stripped and reapplied. The best scenario is to perform this first application with the homeowner or maintenance crew watching so they actually see how to do it properly. Sealer applied at the Orsini complex, a series of high-end luxury condominiums in downtown Los Angeles. Selecting and regularly reapplying a sealer can be an important part of ongoing maintenance. Rigsby recommends owners inspect their floors every six months. "They can tell when a sealer is not at its prime," she says. "It looks like it doesn't have any sealer on it." When it reaches that point, or when the color seems faded, she recommends they reseal. Cowan says homeowners can reseal themselves. However, he warns, they are likely to overapply the material. "It's like painting your house," he says. "You can have a do-it-yourself paint job or a professional paint job. For a high-quality look, I say always go professional." He also believes contractors generally have access to higher-grade materials than homeowners do. No matter how owners clean and maintain decorative concrete, the point is that they must be convinced that it needs taking care of. "Yes, concrete is some of the strongest stuff out there," says Cowan, "but nothing in this world is maintenance-free." Rigsby agrees. "We groom beaches, we mow grass," she says. "Everything's in a constant state of change." And the best way to counter the negative impact of that constant change on decorative concrete is to keep it clean and well-maintained.